With Ian's words ringing in her ears, Dot is on a one-woman mission to save those around her - starting with Lauren. However, her niece finds herself with an unexpected saviour. With Ayesha’s help, Masood writes the wedding invitations and discovers Ayesha’s written ‘the wedding of Ayesha to Masood’ on one. Masood rips it up. When Rashid arrives for tea, Masood lists Ayesha’s attributes to Rashid and anxiously eavesdrops outside the door. Lauren hides at home from gossip, hurt that Tanya’s ashamed of her. Tanya gives her Max’s credit card to pay for her media course books. After a lecture from Dot, Lauren withdraws £100 from Max’s account, fends off a concerned Alice and heads for the Vic. Kirsty’s worried by Lauren’s drinking. Tanya warns Kirsty away from Lauren; Lauren rejects Tanya’s offer to talk. Kirsty leads Lauren to the B&B to sober up and offers a shoulder to cry on. Alice gives Joey and Lauren her blessing. Kirsty phones Max, who lies to Tanya that Lauren’s requested he pick her up. As Max ushers Lauren home, Kirsty slips Lauren her room key. Max cautions Lauren not to tell Tanya where she was. Lauren heads upstairs, dropping Kirsty’s key. Max pockets it. Lola‘s downcast to be parted from Lexi after looking after her for Phil. At the café, Abi persuades Jay and Dexter to get along. Lola takes a liking to Dexter, but he fails to hide his shock on learning Lola has a baby. Jack and Dennis bond over boxing at the gym. Dennis requests Jack read him a cowboys and indians book, despite Sharon’s claim that Dennis won’t like it. 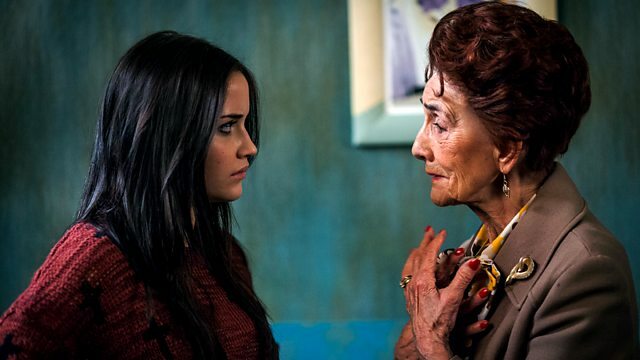 Dot’s unresponsive to Cora’s pleas that she’s homeless and wonders why she came back. Ian suggests Dot sort her troubled family out; Dot starts with Lauren. Jay tries to avoid Dot. She pursues him with questions about Heather’s death. Jay thinks he let Heather down; Dot reassures him that she doesn’t hate him. Cora blags a night in the B&B, claiming Tanya’s paid.